Parting away is the tragedy in every love story. Though its not basically a love story but it becomes one. I was talking about the least scene of episode 8. Where Hyun ji started to disappear means its time for her to go where she belongs. Her memories gives the instinct that she is not really a ghost but a human being who is in coma and the soul is wondering here in there. 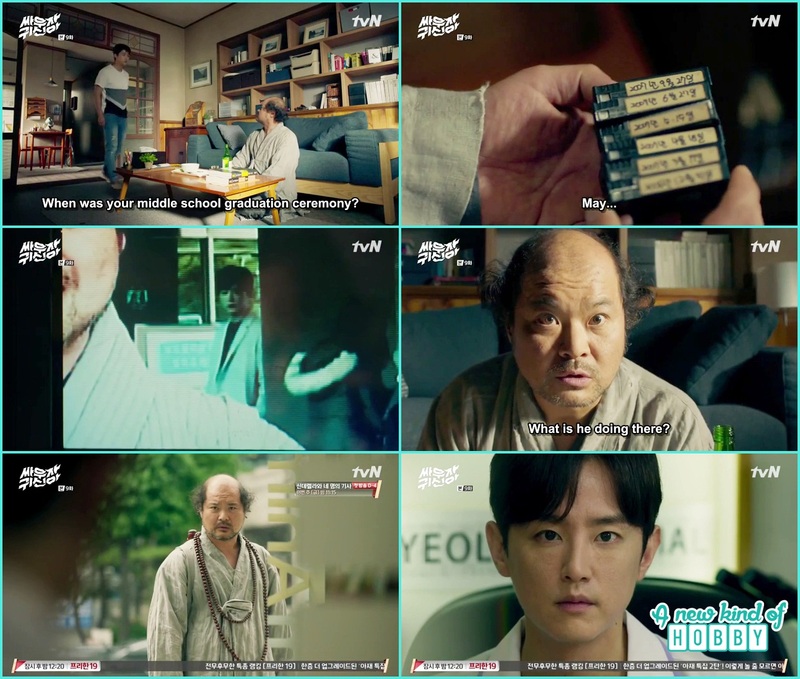 Here we remember one of the fictional drama "49 Days" and "Who are You (the old one)". Bong Pal loose his control when saw Hyun ji disappear, he madly shout looking for her here and there. After few seconds Hyun Ji was back. Her presence calm Bong pal. They both came back home and were into each other head to toe. 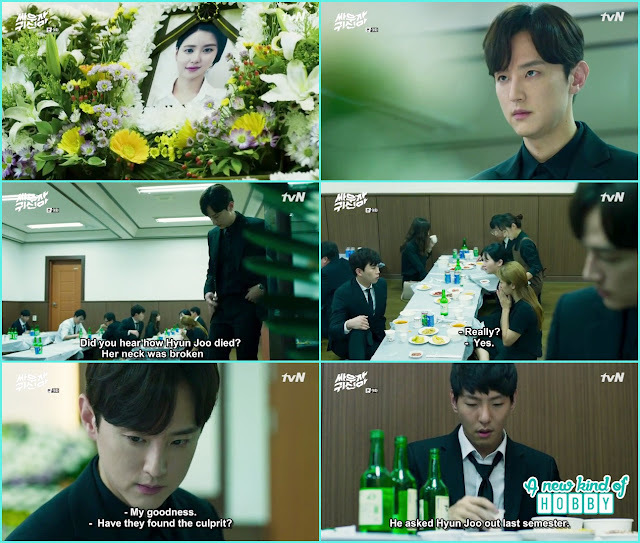 That evil professor offer the condolence at female student Hyun Joo funeral. There he heard people were gossiping how she died, one of them said her neck was broken. Another gossip about her personal life affair stating the senior sitting over there "He ask Hyun joo out .. but she refused". Listening to these gossip we notice a very different gaze in Professor eyes and my sister said may be he will kill Hyun Jo boyfriend also to remove all the traces, but i refuse to agree with her. for me what will the professor gain by killing Hyun Joo's boyfriend when she is no more in this world. Bong Pal and Hyun Ji was felling shy but couldn't understand what's happening with them. A romantic scene happened at the library when Bong Pal was searching for an economic book and Hyun ji was trying to help her finding it. But stuck him closely when someone else came there for books. Standing this close to bong Pal she feel all blushed and flustered at the same moment. Same goes for Bong Pal.Hyun ji ran away from this romantic staring session saying i forgot something and teleport out of the library. We laugh when the book fell over Bong Pal's head. He came back to his senses. He looked every where for Hyun ji but couldn't find her. Then he went to Sundae Soup Club. 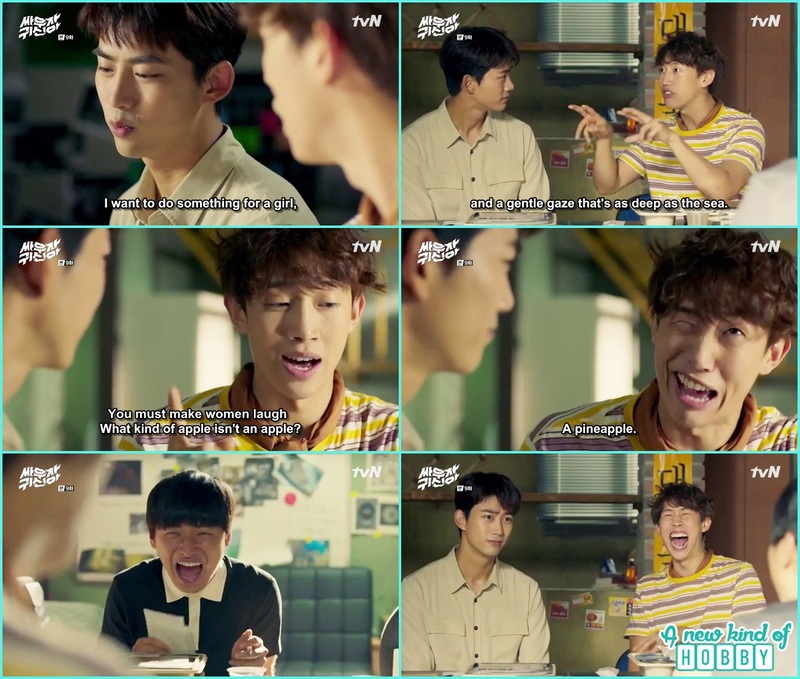 He wanted some advice and ask Chul Sang on of his friend falls for a girl what should he do to maker her happy. It was really a hilarious scene we enjoyed. Chul Sang give him weird tips we laughed also In rang was noticing all those tips on the note pad. The most hilarious tip we laughed was cracking jokes and asking questions. What kind of of apple isn't an apple, we also became curious for the answer and it was Simple "PINEAPPLE" ehehehehe. Me and my sister also use to threw these type of weird questions and enjoy a lot. The innocent Bong Pal acted all weird to get noticed by Hyun Ji but nothing works except Hyun Ji ask "Are you feeling alright today?". We laughed Bong Pal also tried to crack jokes with funny questions and madly laugh himself. Hyun Ji shocked to see this side of Bong Pal, same goes for us. Finally Bong Pal get notice while he ask Hyun Ji for Food and said "Meat works every time". After that they both officially started dating. 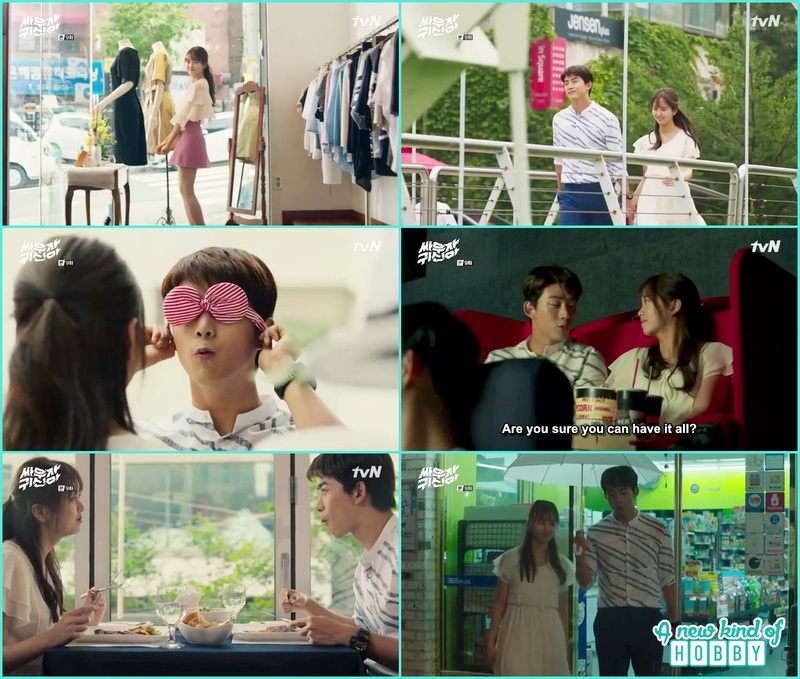 It was hilarious to digest a human being falls for a ghostess and seeing each other. But in Let's fight ghost it happen so. Bong Pal ask Hyun Ji out for the first date. he waited too long for Hyun Ji but she didn't show up, we thought she was preparing a surprise but infact she was confused to choose what to wear. She only had a school uniform, a pink dress and a black outfit. Bong Pal got what she needed they head to a designer store and finally Hyun got a new dress. She was looking too cute. Both did the same as other people do on their date. But Bong Pal's act seems weired to other people. Everyone noticing him. For bong pal he was with his girlfriend but for others he seems to be alone and acting like he is with someone. Hyun ji was too happy she enjoyed along Bong Pal without realizing she is just a ghost. The detectives continued their investigation and found a proof of the professor crossing the tool plaza. They investigate him again. Here we though he would denied and manipulate the proof that its not his car, he wasn't there something like that. Hyun Ji while sleeping saw something related to her life and got scared. Bong pal came in to check what happened. Hyun ji told she saw something and got scared. Then Bong Pal spent the night together with Hyun Ji. The detectives call in the professor to check in the proof they got. We didn't knew what's on Professors mind. My sister thought now he might kill the detective. But the professor agreed to all the questions we were surprised. But something look fishy, the assistant got a call and ask the detective out for a moment. Professor remember on the way back from Hyun Jo funeral how he killed her boyfriend by making it into a suicide. OMG he really was heartless, that why he had the weird gaze at the funeral. Some time my sister caught on situations that might happen during the story we were watching. It wasn't it he also left a suicide note via his mobile phone. Also he put Hyun Joo's cell phone there to make it look more of real. Planning all this he cleanly come out of the case. We were curious how will Hyun Ji find out about the ghost Unni's death and her ID in professor possession. She along with Bong Pal accidentally come infront of professors clinic and professor invited Bong Pal to have tea. he also taunted him about his expressions as he is seeing his girlfriend over there. OMG Bong pal was too innocent he didn't caught on what professor means and what really he is. But Professor was too clever he never show his expressions. He was living a perfect and friendly life. Hyun Ji was playing with the little puppy who make a way for Hyun Ji to brag in Professor room. Now its time for us to worried about Hyun Joo what if professor come in and strangle her neck also. Hyun Ji couldn't see her I D but she saw the butterfly carving confused where she had seen it before. The professor came in we were in fear , oh GOD please help Hyun ji out here and Bong pal came looking for professor to say goodbye as he was leaving. What if Bong Pal miss a few second Hyun Ji would be in Professor hand pleading please leave me. Another ghost appear, Bong pal along with other members went at a villa to capture the ghos. We become more scared when the girl pull the curtains for light thy suddenly came back to their origional position. OMG it seems too scary as of we never got scared enough when saw things moving due to ghosts possession. This scene really scared the ghostnet guys as well as us. Monk Myung was dead worried for thing related to Bong Pal's life and his father. 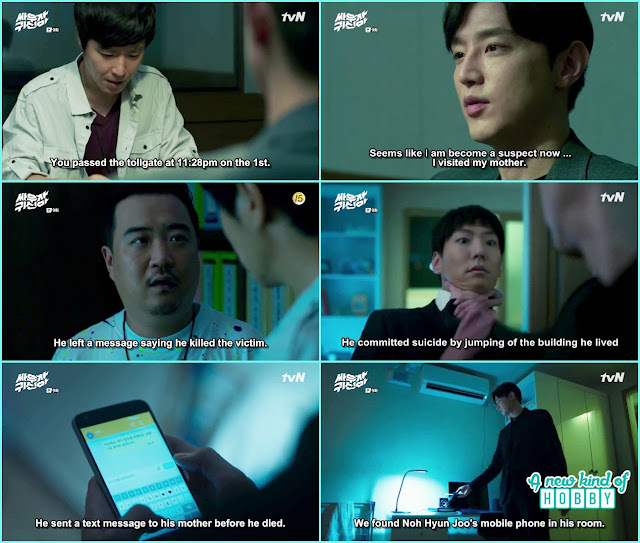 he check Bong pal's phone and feel something weird it was Bong Pal's father messege a kind of clue for something. He ask Bong Pal when was your school Graduation Ceremony knowing the date he checked out the recorded tapes and found one relate to it. Watching that video file we were shocked to see Professor peeking over Bong Pal. OMG from BonG Pal's childhood professor kept an eye on him. What Bong Pal father trying to help Bong Pal about he still don't get any idea about. Monk Myung was all worried. Hyun Ji heared something she shouldn't. It was chul Sang advising In Rang ... "This is what happen when a man falls for a ghost .. the ghost will take away all the enrgy". In Rang tried to stop him saying don't say anything Hyun Ji will hear out. But what to do Hyun Ji already heared what he said. It was the cruel reality she come to knew that she is the ghost seeing BonG Pal human. She become all grieved but Bong Pal cheered her up and told her she is the person he likes. Bong Pal after confessing grab her and kissed her. It was a prove he didn't care what other thinks and say all what matter for him how happy he is with Hyun Ji. The episode ends here with a passionate kiss and confession. Lets stay tuned for episode 10 to knew Hyun Ji's reaction after Bong Pal's confession. Till then stay Fighting. Let's meet in next episode review.